with nightly builds and tremendous improvements in U++, I think it is time to reconsider little PR. Recently, we have been mostly silent for almost 1 year, not annoucements or anything anywhere, no releases. I guess it was a good time for "silent work", but now when we are approaching a shiny new U++, maybe we could try to be a very little bit more noisy. For starters, I think there should be someone that would care about freshmeat and usenet annoucments. Basically, I think that "weekly review" of svn changes between nightly-builds would be ok.
between last annouced revision and last release, adapt (remove uninteresting elements, edit those interesting), submit to freshmeat and to some relevant usenet conferences. (Maybe, USENET could be less frequent to avoid annoying people). Of course, the first annoucement will have to be a bit "bigger"
This is simple but quite boring work, but it would make BIG difference. - Deprecating the project name "Ultimate++" and using U++ only in the future. I am afraid that Ultimate++ does not sound seriously enough for many. - Redesigning U++ frontpage. I think that the general style of website is quite OK, but maybe we should put info there. I think before drawing attention to U++ we should get prepared to explain that U++ is not just a cool C++ library and an extremely useful developer's tool, but also a system, which is completely different from everything else that C++ developers got used to use. Otherwise we will have to answer the same questions over and over again. It took me a lot of time to realize how huge is the difference between U++ and everything else. Novo, I`m totally agree with you. But how can we do it? The only way I think of is creating short but succinct text (may be with short code examples). Something like "Wetting your appetite" from TheIDE Manual, but even more effective. I'm not saying we should be afraid of that. I'm just saying we better list these differences (and detailed explanations) and put this list in an unavoidable place. OK, pack of rough sketches. No beauty, just to visualize the idea... May be it`ll lead someone to better realization. Just for someone, it is important that while the novelty product, Ultimatepp is 100% C++ language with strict syntax. For me, as I understand it, it was a very important factor. There is no need to hurry up with the change of the logo. The new logo does not bear a message that this is a continuity with the C++ (unlike the old). Also, when I first installed the product, I have long sought to know what the name of the menu? Correct! - Ultimate++! But it was not there! The menu was another unknown word - TheIDE! I think this a big mistake. Better would be to write the menu - Ultimate++, or perhaps - Ultimate++ TheIDE. Even in the letters to our visitors, the signatures must be kept - Ultimate++ team. Everywhere! And I think the loss is impermissible, then that site does not send notifications of new messages in subscribed threads in the mail. People read the forum and went - and then a letter - "means Ultimate - it works!". It is very important! When a promotion commercial project - creating a website that collect the money (actually preferred product for the money) and a few sites that do not sell, but simply organize "fish place" for the target audience (the place where people congregate target audience) and which for that very target audience periodically quietly throw the message on the product sold. Of course there is not expected to take the money, but can be used similar PR technology. Ultimate++ - sounds (unlike U++). You can say it. This is yet another media vehicle. I think you need to add more sections of the type of "Getting Started" (I do not know at this site or another). And need more sections, which describe the benefits to me, rolling from another tool, which helps to quickly achieve the goal to Ultimate++. Again, comparing the PR technology with the commercial product - creates a separate series of documentation - Documentation for the promotion of vendors, promotion documentation for journalists, while not explicitly called for one of those articles, but each category of readers usually know exactly its documentation. And for beginners, and the above categories of readers are not important nuances of change in the SVN code (as it may seem sad). For them, the goods - the very innovative approach to C++, and technology development programs in general. So it is necessary to give them their goods (I repeat - perhaps not on this site, by the way feel like to have as a link to all the project sites). We can give an example of a product Mozilla. I'm not sure what to exactly the same sites as in Mozilla. But the idea - is clear. 1) There is no need to hurry up with the change of the logo. 2) The new logo does not bear a message that this is a continuity with the C++ (unlike the old). 3) Better would be to write the menu - Ultimate++, or perhaps - Ultimate++ TheIDE. Even in the letters to our visitors, the signatures must be kept - Ultimate++ team. Everywhere!.. People read the forum and went - and then a letter - "means Ultimate - it works!". 1) I must disagree. Current logo is of former 90`s style. Please look at the modern logos, see the difference. There`s no need for such an advanced framework (maybe the most advanced one for C++) to have old-looking logo. Redesign is even more a task because of (3). 2) All the logos have C++ signature inside of them. 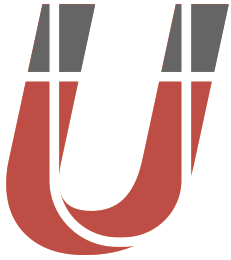 It was my aim to have C++ inside of U++ logo. Deprecating the project name "Ultimate++" and using U++ only in the future. I am afraid that Ultimate++ does not sound seriously enough for many. Regarding logo, I might have been a little bit specific. but change the text. Of course, some minor update of graphics would be nice. But over, I think the shape is quite characteristic. I always wondered what does colour table plus two rulers stand for in U++ logo? Funny. But with the logo is better not to joke. This logo is not the logo. This is the first picture for the cover of the booklet. Or for flashwindow. The logo should be more strict. The logo must not lose the idea and when printing on grayscale printer, or even on 2-color printer. Perhaps for the site to use the graphic idea of the image would be quite good. As Mirek suggested, a horseshoe magnet with two ++ at heads, something like this image. (with ++). The design of site is too old. We need something more modern. I'm thinking also at a bug reporting tool and let the forum only for trouble that users have. After these modifications I think U++ will become a more serious project.